EUR/USD Technical Analysis: Are Euro bulls really throwing in the towel ? 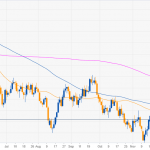 Home All Posts EUR/USD Technical Analysis: Are Euro bulls really throwing in the towel ? The main SMAs are coiled together suggesting that in the medium-term investors are undecided. EUR/USD is trading above the 1.1400/20 support in a consolidation day. EUR/USD bulls might reach 1.1460 before any meaningful break below 1.1400 figure.